It’s almost 3 o’clock on a gorgeous Saturday; the weather is a balmy 78 degrees F., sunny & slightly breezy with a beautiful bright blue sky filled with big white fluffy clouds – what could be better? Our gas prices are sitting at a very nice place – $3.43/9 – that’s the lowest it’s been in a LOT of months. I managed to fill up my tank, knowing that the past few times I’ve said “Oh, look – gas is down!” then DIDN’T take advantage of it RIGHT THEN, it either went up later that day or the next. I’m sort of ‘wising up’ in my old age, ya know? Not much going on lately; grandson’s second flag football game was today – I missed it (youngest son needed to be driven somewhere at the same time, so ‘Mom Taxi’ went into effect.) Husband was ‘going’ to go in my place but then noticed a low air pressure in his Jeep tire, so spent the rest of that time checking it out, filling it with air from our portable air pump. The pump started smoking . . . you can guess – that ended any shred of him going to the game. He ended up putting the canned “Fix a Flat” stuff in the tire to seal it; will go to the dealership next week to check it out. It appears that BOTH of our cars have the same problem – leaky valve stems (you know – the place where you unscrew the little cap & put in air). Fun stuff . . .
Tonight’s dinner is going to be the White Chicken Chili/Soup. I’ve posted the recipe here before – super easy. The strange thing about our house now is: the ‘leftovers’ just aren’t disappearing like they used to (middle son moved out/youngest doesn’t ‘like’ leftovers! . . . read that last part in a sort of whine). Hence, that leaves husband and I and we, together, still don’t seem to consume as much food now that he’s retired. There’s still one helping of sloppy joes, 1-2 helpings of rice & turkey w/gravy (sort of like a turkey stroganoff) and one large helping of mac & cheese. I get a bit crazy just trying to figure out what to make as well as how much! My usual batch of the White Chicken Chili/Soup will feed, probably, 8-10, so I’m going to ‘adventure’ tonight and only make a half batch – we’ll see how that goes. If it looks like there’s lots, I’ll just send some home with middle son – he doesn’t mind leftovers! (I try to get him to take them home most of the time but he’s usually in between clients and doesn’t want the food to spoil in his car . . . go figure . . . sigh). Cream together butter, sugars, and egg. heated through. Transfer chicken to serving plate. Top with crushed croutons & remaining Parmesan. saucepan 20 minutes or until tender, drain. toothpick) or until edges are golden. Cool in pan over wire rack. sheet. Bake until tender, about 1 hour. fork; place in medium bowl, discard shells. medium heat. Add onions & cook 2 minutes. smooth & thick, about 2 minutes, stirring. about 5 minutes stirring to keep from sticking to pan. 20 ¬25 minutes. Makes about 8 servings. blender or 2 knives until mixture resembles fine crumbs. of 13 x 9-inch baking pan. BAKE 15 minutes. butter layer. Bake an additional 15 minutes. Cool. Cut into bars. Still working on the crocheted baby blanket; the pattern is SO easy, I’m impressed it’s going quickly. The entire blanket is just either crochet 1, or chain 4 – that’s IT! (so simple even I can do it!) I’ll photo it when I’m done. I don’t think I’ve mentioned that I’ve found ‘another’ play-thing: playing Oregon Trail, American Settler on line. Yes, now I’ve joined the rest of my family at playing video games. I absolutely REFUSE to do the ‘share with friends’ thing – when I first signed onto Facebook someone ‘befriended’ me by giving me a cartoon cow – next thing I know, I’m being besieged with all sorts of requests for more food for the animals, extra energy, etc. – I ended up getting so fed up, I quit Facebook . . . the first time. Friends then told me I didn’t have to look at that ‘stuff’, I could ‘hide’ it, so I did. Now that I’m playing this game (not on Facebook) I will absolutely NOT do that to my friends! I’m happily ‘hooked’ on expanding my territory, keeping people from dying of diptheria, raising crops, etc. Goofy-yes, but a innocent pastime adventure for me. Today’s stacking up to be a rather relaxing day – think I’ll go copy more recipes for you. It’s a lovely fall day here in Michigan; temperatures are at 65 degrees F, sky clear and blue. I’m not really a ‘fan’ of cold weather, but today really makes me a fan of Fall. Hope your weather is ‘decent’ – we won’t have many more days of this so I’m trying to enjoy it. Went out shopping earlier to the drug store – I love checking their fliers for things on sale with BETTER prices than the grocery stores – like bottled water, cereal, canned salmon, instant coffee, etc. Cut chicken breasts into strips. Heat oil in a frying pan. smooth. Stir sauce into chicken/cabbage mixture. 1 minute. Refrigerate leftovers within 2 hours. Prepare cornbread mix accordg to pkg. more powdered sugar until it is easy to roll. Take each ball and sandwich between two pretzels. on wax paper to set. through. Season with salt, pepper & vinegar to taste. 10 – 15 minutes longer. Potatoes O’Brien in place of the hash browns. cheese, spinach, salt and pepper. together in a small bowl. Spoon about 1/4 C.
of the spinach mixture onto each chicken breast. how many total toothpicks were used! Brush each chicken breast with the olive oil. cheese on top of chicken (optional). 40 minutes, or until chicken is cooked through. sure you have removed every last toothpick. Serve whole or slice into medallion’s. onion, Italian seasoning, salt, and pepper. Blend until pureed. Set pizza sauce aside. sour cream and 2 ounces of shredded cheese. dish (pie plate or 8×8 works). zucchini, using a medium sized grater, and set aside. soda, baking powder, salt, cinnamon, and allspice. just until combined. Then fold in the chocolate chips. from the pan and cool completely. Our gas prices have come back down to $3.49/9 – YAY! While I was at the drug store I ended up deciding to get my flu shot. Last year when my regular doctor asked I said I’d pass – his response: “Pam, being a cancer patient, you can’t really afford NOT to get one!” That decided it for me, so I’m just going ‘with the flow’ this year and getting it done. Physically I’m feeling good again – no real signs of the kidney stone thing – I see that doctor in a few weeks. Well, friends, I’ll close for now – hope you’re having a really nice, RELAXING day – I know I am!!! Busy Day – Busy Day!!! I MUST be feeling better because I have a TON of energy today! That’s a GOOD thing; got up, emptied the dishwasher, filled it up some, washed the remaining (non-dishwasher) items. Started a load of washing, put one in the dryer and began working on Friends Group (special needs) business/paperwork. Got the business meeting notes typed & ready to go, organized more group paperwork, sewed a button on husband’s shorts. (I know there were more things in between here, just don’t remember exactly ‘what’). Then, energy took me outside to photo the two (below) baby afghans. That got me noticing the weird, wild vines that keep growing all over our yard. They’re really tough, grow quickly and I tripped on one – that led me to get the outdoor gloves out and attack the vines, cutting & throwing. THAT led me to noticing the vines had grown into our grill – you guessed it: opened the grill (also noticed it need cleaning out – lots of leaves from some squirrel who thought he/she would make a nest there – can you tell we don’t use our grill much?). After all the vine-ripping, leaf throwing, ashes cleaning I came inside with 3 requests: something cold to drink, a back pill (for pain) and a SIT DOWN! Having attained all three, I’m now here with you. Whew! Don’t know what got into me – but I’m glad I got lots of things done! Oh, also brought inside my Wandering Jew plant; our evening temperatures are getting too cold for it to survive in it’s hanging basket. (Of course, THAT led to me re-arranging the other plants that also reside on that table, dusting – which led to dusting the living room & dining room . . . YOU GET THE IDEA. I think, for now, I’m pretty well done with ‘extra activities’! Here are the two baby blankets I knit/crocheted for the Detroit Vet’s (if you remember, they are the ones I didn’t need to make in a hurry, so I’m saving them for next year’s Baby Shower). The colors for #2 are a little brighter than are showing up in the photo. Weather-wise, we have a gorgeous day out there! It’s 73 degrees F., sunny and clear! I’ve read that it’s supposed to rain later, but for now – I’M JUST ENJOYING IT!!! Gas-prices: Our gas prices have DROPPED quite a bit in the past 2-3 days – not sure why, but who cares!? It went from $3.59/9 down to $3.49/9 – pretty cool, eh? Lot’s of Fall recipes comin’ in – here ya go! 1/4 C. cheese. Spoon meat mixture into 8 in. crusts, cover & freeze until firm. onion and ground beef over medium heat. Add spaghetti sauce, and simmer 15 minutes. remaining pasta mixture and mozzarella cheese. Bake 30 minutes or until cheeses are melted. drain excess grease from beef mixture. Put beef back into pot; add in diced tomatoes. Add in chicken broth (or beef broth, if using). minutes to let all the flavors blend. Melt butter in 9 in. square baking pan. Seems like, lately, I just haven’t taken the time to write blog entries – sorry; Thursday – Tuesday I just wasn’t feeling well – not sure exactly why. Ended up going home mid-service Sunday – just didn’t have the energy to sing or even concentrate. Visited doctor last week and found out I might have kidney stones – oh, joy. Have to wait until beginning of October before seeing a Urologist to confirm; I’m not in any pain, just not looking forward to another ‘new’ adventure in my life. Had the enjoyment yesterday of going out to lunch with two friends I’ve known since high school. We’re all in the same Sunday School class and, even after all these years, we continue to learn new things; turns out two of us went to the same Methodist church during tenth grade and were in the same Youth group and sang in the church choir (although neither of us were close friends at that time!) That same friend and I sang in the Girls Choir in high school, where we did become good friends. Last night was Knit/Crochet night and we had a new member join us. It’s always nice to have a group you can join in with and feel ‘at home’. She said she was very happy to find our group; it appears she had searched out several groups and found that most of them were ‘anti-crochet’, for some reason, OR they charged big dues (we’re free). I was surprised to find that she had only been crocheting 2 weeks, because she was crocheting a rather complicated afghan AND doing a great job at it!. I’m happily back to knitting baby hats; don’t remember if I mentioned in my last blog that I delivered another batch of baby hats to the hospital – think this time it was something like 30. I do have a nice crocheted baby afghan pattern which was given to me by one of the members (she wasn’t there last night); I’d like to ‘attempt’ to crochet this. SHE says it’s very easy – we’ll see (I’m not good at reading crochet patterns) and was hoping she would be there to just talk through the pattern with me. The weekend is looking a bit ‘busy’- Friday night is my special needs group’s Gym Night; Saturday morning is grandson’s first Flag Football game, that afternoon (3 p.m.) is a wedding and 6 p.m. is the ‘adult’ reception – so glad I’m finally feeling better so I can enjoy the activities. to a 2 quart baking dish. Pour remaining cheese on top. and uncooked oats. Stir in desired fruit. than 3 days before eating. chocolate chips and 2 tablespoons miniature marshmallows. banana and 1 tablespoon chocolate chips. each chocolate chips and peanut butter chips. or 2 tablespoons comb honey. Banana Power Oatmeal: Stir in 1/4 cup banana slices. Almond Power Oatmeal: Stir in 1/4 cup toasted almonds. Blueberry Power Oatmeal: Stir in 1/4 cup blueberries. Blackberry Power Oatmeal: Stir in 1/4 cup blackberries. oats in the mixing bowl; stir together. with rest of crumb mixture. Bake 40-45 minutes. Cut into squares, it will fall apart easily. oil until golden brown. Top with vanilla ice cream, if desired. qt. heavy saucepan. Heat over low heat, stirring frequently until dry ingredients are dissolved. Stir in chicken & pepper; simmer, uncovered, 25 minutes, stirring frequently. Layer half of lasagna noodles, chicken sauce & cheese in well-buttered 9 X 13 baking dish. Repeat layers again. Bake 35-40 minutes or until hot & bubbly. Let rest 10 minutes before serving. blended. Add to corn mixture; mix well. Using hand mixer, beat sugar, cream cheese & vanilla until smooth in medium bowl. Unroll crescent rolls; stretch sheet slightly. It should be in the shape of a rectangle. Spread cream cheese mixture over top of crescent sheet, leaving a gap at edge of about 1/2 inch. Sprinkle choc. chips on top, then roll up tightly & wrap in cling wrap. Refrigerate at least 2 hours or overnight. Line a cookie sheet with parchment paper to prevent sticking. Slice roll into 1/4 ” slices. Bake 12-14 minutes until they appear golden brown; transfer to wire rack to cool. Eat warm or room temp. I don’t know what your weather is like, but ours has taken a turn to the cold-now it’s time to start wearing shoes & socks, no more sandals – sigh. Time to drag out the sweaters & light jackets. It’s 10:10 a.m. right now and the weather is sunny & clear, but the temps are only sitting at 55 (cold) degrees – yuck. I guess it’s better than rainy and gloomy, right? Time to close here and get started on my day. Hope you have a GREAT day! Sure is lookin’ like Fall around here! Boy, our weather here in good old Michigan is holding to the saying: If you don’t like the weather here, wait around a bit and it will change! It was in the 90’s Mon & Tues, then we had a HUGE rain/thunderstorm last night and now we’re 72 with rain and big winds. It’s supposed to be in the 60’s tomorrow – really weird. Sorry I haven’t been as diligent with writing here, been feeling a bit ‘under the weather’. Been working through some health issues (not cancer) but will have to see a Urologist – oh, joy. Knit/crochet-wise, finished the crocheted squares baby blanket (the second ‘extra’ one) but still want to crochet a white border around it. I found out at the Knit/Movie night Tuesday that they actually DO have another church group making the Detroit Veterans Hospital Baby shower blankets, so I don’t have to make myself crazy trying to make more; the two I have done can go for next year . . . YAY! Had an opportunity to deliver more baby hats to the local hospital today (that hospital is sort of close to my Ob/Gyn) so I made one trip work for 2. It wasn’t the amount (baby hats) that I usually deliver, but they were happy. After I crochet the border on the last baby blanket I can get back to knitting Newborn & Premie hats (and perhaps the occasional chemo cap). cool, then cut into squares. Add all remaining ingredients; mix well. to edges. Roll & cut into slices. mixture in an ungreased 9 X 13 pan; top with stuffed peppers; pressing down gently. Cover & bake 1 hour. In a saucepan, heat sauce ingredients until cheese is melted; serve over peppers. Makes 8 servings. Place one can beans in blender with 2 C.
chicken broth; puree then add to crockpot. skillet; add cilantro, jalapeno & lime juice. sugar until light & fluffy, about 2 minutes. until combined. Evenly pour into pan. 2 minutes. Cool slightly before serving. 1 C. powdered sugar plus 1 T.
the dry ingredients and blend until smooth. from pan and frost the top with the icing. ps: Sorry for the change in font size on some of the recipes – my server seems to like to ‘change things up a bit’ sometimes. Been Away a While . . . No good excuse! I just looked back on when I last made a blog entry and it’s not ‘my norm’; I don’t have a really good excuse, either! Sometimes you feel the need to write and at other times, not so much. I guess it’s because there’s not much going on around here lately! We attended another Sunday School Picnic Saturday – it rained a bit, forcing us to move either indoors or to the shelter of the garage. Nice event: good food & friendship, glad we could go. Yesterday began the church choir resuming (we take the Summer off); practice started up, again, at 4:45 p.m. It felt good to get back into the ‘swing of things’ – we’re sort of slow starting up, with only about half of the usual people – guess some are still on vacation. This week starts up a change in our ‘watching our Grandson’ – he’s now 7, so the word “Babysitting” doesn’t exactly fit. I will be experiencing my first trip to (almost) Walled Lake – actually, it’s a bit closer to Union Lake, but still – it’s FAR away from where I live! (Long story, short) grandson has two parents: His Dad (our son, who lives about 5 minutes away from us) and his Mom. They split up (having never married) a little over 6 years ago; she was living about 15 minutes away, but then met a man, he bought a house, and now they live about 25 minutes away, in Walled Lake. I have never been there, but will begin my ‘new’ driving experience this Friday, as I have to pick up grandson at his bus stop close to their house, after school. I guess I would explain my driving experiences thusly: I get lost in a paper bag! My husband, on the other hand, is an EXPERT at finding anywhere/anything and doesn’t understand how I could possible get so LOST! He thinks IN MAPS in his head and knows almost any area, having driven them while he worked for AT & T. Oh well – with some help, I should be able to traverse the ‘new’ route and find said bus stop before the bus gets there – HOPEFULLY! This Tuesday (tomorrow night) will be another Knit/Crochet Movie Night for my group. We haven’t held a Movie Night in a good 3 months and the ladies are asking for one. The food theme is Soups & Salads; so far, we only have 6 people coming, which is kind of disappointing, but you take what you get, right? I’m not sure if it’s the movie (I chose it: “Out of Africa” – great ‘chick flick’) or the food theme, or just the time of year – we’ll see. You know me . . . sometimes I get a bit “OCD” (Obsessive/Compulsive) – well, the end result of 19 blankets (AFTER I’d asked the lady how many people they have signed up to receive them at the baby shower and finding out there are 25) made me feel a bit of an ‘under-achiever’. The group did their best, but in the end, I sort of felt like we let the Vets down a bit (that’s just MY opinion, I didn’t tell the group that day that there were 25 people waiting, as I didn’t know until then, either). That got me to thinking: maybe . . . just maybe, I might be able to crank out one or two more blankets before the shower. The friend of mine who originally came up with this charity (the Vets hospital is a client of her company’s) said she wanted to attend the shower this year, just to see all the ladies receiving their gifts AND she wants to drag me along. (If you know me – I’m not one for self aggrandizement (praise) so I really don’t want to be there for that BUT I would like to see how they handle the shower, just to give me an idea of how to ‘pitch’ the event NEXT YEAR, to my knit/crochet group, so I agreed to go. 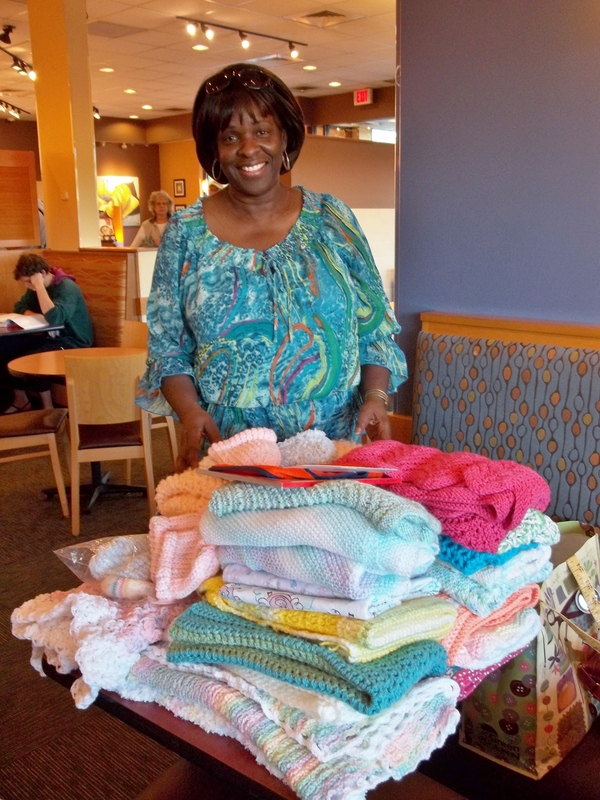 Also, by my attending the shower in 2 weeks, I’ll be able to hand-deliver the extra blankets! I’ve finished the one I believe I mentioned in a post or two before this one (knit; done in large solid-colored stripes) and now I’m attempting to crochet large solid-colored squares for another blanket. The squares are easy – the difficult part is: My right index finger joint seems to not like this extra crochet work and keeps swelling up to the point where I can’t tolerate the pain! Not good! I gave it a day’s rest yesterday and am thinking I might just tape up the joint to make it rigid and see how that goes. (I’ve already tried using my middle finger, instead – it works but it’s not as productive.) I’m using ‘stash’ yarns – colors like baby pink, baby blue, the bright mint (from other blanket), butter yellow, medium lilac, darker blue – I have 6 squares done and probably another 6 or more to go. Not sure how big I’m going to make it – doing 2 squares in each color – we’ll see. WISH I’d have known exactly how many people we were making blankets FOR – THEN I might have been able to do an extra little ‘push’ on the group to make sure we met the objective number of blankets! (I’ll have to remember this for next year, for sure!) Oh well . . . you know me – a bit of an ‘over achiever’ . . . sigh. Weather-wise it’s been a bit strange: cool in the mornings (in the low 60’s) warming up later on in the day to the 70’s – some rain. You can tell Fall is on it’s way – sigh. Gas-prices? It’s been about the same around here – the ‘norm’ lately has been around $3.69/9 per gallon (for the cheap stuff) BUT when we went to the picnic Saturday (about 1/2 hour away) the prices were lower there! It’s almost sad to think that we’re OK with prices in the $3 range now, eh? But, on the other hand – we all HAVE to drive, so what alternatives do we have? Walk? Take a cab? (NO WAY – too expensive! ), take a bus? (very few routes available) or just STAY HOME! (sometimes not an option, either). Oh well – we can always complain! That’s free! from oven & top with lettuce & tomatoes. pepper, cracker crumbs, egg & soup mix. desired. Place cabbage rolls in 3 qt. crockpot. refrigerate several hours to blend flavors. salt on each zucchini slice; set aside 10 minutes. side, until cooked, about 1-2 minutes per side. 15 minutes. Let stand 5-10 minutes before serving. dough, pulling to cover cream cheese completely. dessert. Bake 30-35 minutes until golden brown. 1: flour 2: beaten egg 3: bread crumbs. with cooking spray. Bake 15 minutes. cheese & sprinkle with pizza seasoning. muffin tin; bake 20-25 minutes. Well, friends – that’s all the excitement from around here, lately. Hope you are: (a) staying WARM – if it’s cold where you are (b) taking a few minutes to do something YOU like, (c) remembering to smile some during your day – no matter WHAT comes your way! Remember, it takes less muscles to Smile than to frown!